Metro announced a number of safety changes it will implement in response to last week's tragedy, when an arcing rail filled a tunnel with smoke, resulting in the death of a woman and the hospitalization of dozens of people. Among the actions that will be taken immediately, Metro says train operators will now be able to cut off trains' ventilation systems, which constantly take air into the trains, without first contacting central command to get permission. 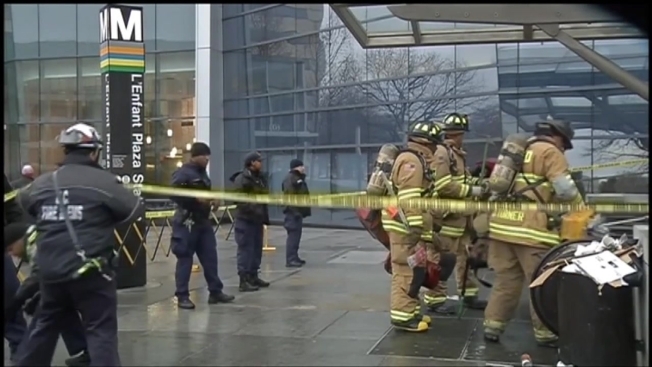 The NTSB said Wednesday there were anomalies when it conducted a test of the system to ventilate the tunnel that didn't match what happened at L'Enfant Plaza during the Jan. 12 incident. Metro says it plans to install clear signage on trains that tell first responders which doors are emergency doors. The transit agency will also set a schedule for the next three years for emergency, quarterly drills. A report will also be released on smoke detectors in tunnels and stations, News4's Transportation Reporter Adam Tuss reported. During Thursday's board meeting, Metro also discussed the encryption that prevented D.C. fire crews from communicating with Metro. The D.C. Fire Department recently made a move to encrypt its radio transmissions, meaning only agencies that know how to tap into the encrypted network can communicate with D.C. Fire and EMS units. Acting NTSB Chairman Christopher Hart said he was pleased with the immediate action. “When the players are up close to the investigation and see an issue that needs to be addressed, then they are in a position to address them," he said. Jackie Jeter, a former train operator and the president of Amalgamated Transit Union Local 689, which represents metro bus and train operators as well as others, said the issue with Metro is deeper. “Where I draw back from is the fact that there is not as much of a hurry to actually establish a safety culture so that these types of accidents do not occur," she said. On Jan. 12, the day of the L'Enfant Plaza episode, Metro's communications controls were not synced up with D.C. Fire's communication controls in the new encrypted setting. Those controls are housed at a control room at One Judiciary Square, NW. The cause of the arc that sent the smoke through the tunnel and train remains under investigation. The NTSB hopes to complete its investigation within a year. The incident began shortly after 3 p.m. Jan. 12, when an electrical breaker tripped at one end of a section of the third rail near the L'Enfant Plaza station. One train stopped in the tunnel and another at the platform, and the tunnel and the trains filled with smoke. Riders from the train in the tunnel have said they were trapped for at least 30 minutes before they were rescued. Carol Inman Glover, 61, slumped to the floor unconscious near the front of the train, where the smoke was heaviest. Three other passengers tried for 20 minutes to revive her with chest compression and mouth-to-mouth. First-responders then carried Glover out of the tunnel and began CPR. She was taken to a hospital but died the Office of the Chief Medical Examiner ruled Glover's death accidental by acute respiratory failure from smoke exposure.